Masala peanuts is one of my favourite tea time snack. This crispy and spicy peanuts can be prepared in less time and can be stored for longer time. 1. Roast peanuts in a pan for few minutes or keep it in microwave high for 1 minute. 2. Mix besan flour, rice flour, red chilly powder, chat masala and salt together. 4. Add peanuts and mix till the peanuts get coated well. 5. Heat oil and then drop the peanuts gently. 6. Medium the flame and fry till the flour coat becomes crisp. 7. Drain excess oil on a kitchen towel. 8. Garnish with dry roasted and crushed curry leaves. 9. Cool and store in air-tight container. this looks crispy and spicy....yummy! Love these.. I make these often..
Spicy, yummy and tempting masala peanuts. Awesome crispy cruncy groundnuts.Usually buy from shops, never tried at home. So simple, would try today.Thanks for sharing. 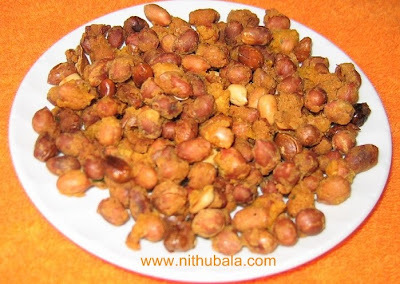 my all time favourite too ..
nitu I love this peanut....thanks for this nice recipe. A delicious tea time Snack! Your peanuts sound really really good! And dangerously addictive too. This peanut is always my weakness:) Looks very tempting and delicious dear. This is my favourite way of having peanuts, drool. wow, love these crunchy/munchy masala peanuts. I love these masala peanuts, looks so yummy. BTW, I tried your fried idli, it came out really well, will blog about it after the roundup. What a yummy & tasty snack! Very interesting. My father loves peanuts: I can see him eating a lot of your masala peanuts.